The 1200 m2 MediaLab enhances media literacy through the creation of a unique opportunity for kids, alongside their parents, professionals and decision makers, to discover the array of new possibilities in image culture, art and media convergence in a hands-on and playful manner. This digital playground and experimental garden invites the visitor to discover, experiment, observe and be amazed. According to people like media theorist Kevin Kelly, technology is an extension of the human body. To be more precise – it extends not our genes, but our minds. Everything that humans have thought of and produced over time – which Kelly dubs ‘the technium’ – has followed, shaped and become integrated into human evolution. This is so much so, in fact, that technology is now a part of evolution itself. From the invention of the wheel to the airplane and the computer, technological developments always have influenced the way we live. However, the speed with which these technological developments take place today is exponentially increasing, both in the public and personal environment. New tools and new applications influence us in an accelerated way at an emotional, cognitive and social level. With this year’s theme, (Urban) Jungle, the MediaLab wants to playfully refer to the accumulation of technological possibilities and subsequently give rise to the more amorphous understanding of the distinction between different media, and even between man and the machine itself. 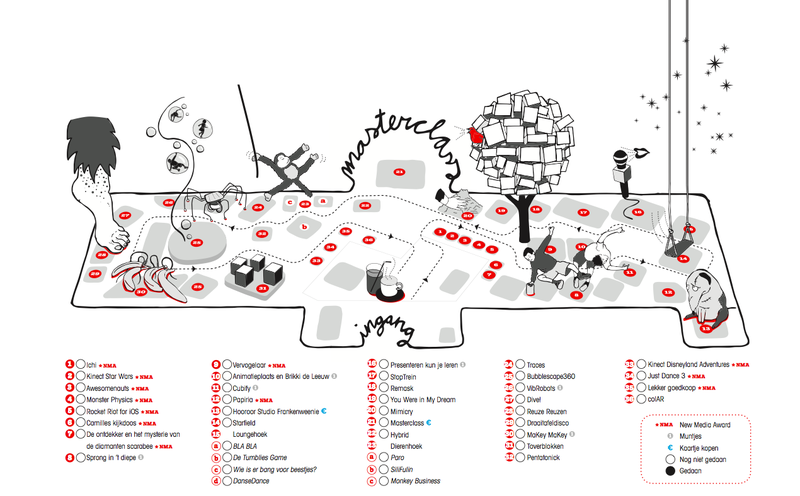 This year, more than forty workshops, games and installations from Finland, the Netherlands, United States, France, Canada, Spain, Japan, Serbia and Germany will be exhibited through our interactive lab, creating manifold opportunities for the audience to experience, experiment, play and wonder. The Cinekid MediaLab, one of the biggest media labs for kids in the world and it is a place where the worlds of film, television and new media meet. But this is not just for kids. Grown-ups, too, will be able to smell and feel what is hot & new on the media horizon and witness how kids move and play around freely within this experimental garden. Even for our youngest generations – the digital natives of this epoch who are raised with these new media technologies – the cascade of developments, possibilities and their implications can seem overwhelming. The MediaLab wants to offer an opportunity to young people, but also to their parents, educators, decision makers and other (media) professionals to experience how these latest technologies influence the world we live in. It aims to function as fertile soil for imagination and creativity in three ways. Firstly, (Urban) Jungle refers to the bizarre collection of monkeys, seals, insects, giants, hybrids, and singing birds that populate the programme this year. Moreover, it is the way the audience is able to interact with these species that is most striking: the works and program offer up new relations to the natural world, in approach and conception, as suggested by new technological interfaces. The traditional keyboard is bypassed and the visitors of the MediaLab will find their own bodies becoming the new interface. For example, in Monkey Business, a project by Jan Sieber and Ralph Kistler, the audience can dance with a toy monkey just by waving their arms. With Ryoto Kuwakubo’s project SiliFulin, consisting of a tail made of servo motors attached to a balance sensor, they can experience what it is like to have a tail that truly responds to their hip movements. Have you ever tried becoming friends with a mechanical seal? Paro loves to cuddle and responds to light, sounds and touch, and is almost a real animal. In addition to these enhanced forms of animal-human interaction, the second contribution of (Urban) Jungle is the immersive experience it can provide as media jungle. In the contemporary landscape, where the borders between different media are starting to fade, transmedia or crossmedia forms of storytelling mean that content travels from platform to platform and often the viewer/user plays an active role. A fine example of this kind of experience design is Thijs van Vuure’s Birdifyer installation. In this installation, kids are taught how to sing like a bird! A bird tutorial, audio recording tools and a huge tree sculpture with mapping video together embed the viewer in a participative, surreal and highly visual environment where they find themselves singing like a nightingale. Another example is the physical and spectacular installation BubbleScape 360 by Marnix de Nijs, in which the viewer is seated in a racing chair on a motorized structure equipped with a joystick. A screen is positioned in front of the user. While he or she is controlling the speed and direction of the chair, rotating panoramic images are projected on the screen in front of him or her. Turning to the left, the user flows down into the landscape; by turning right, the user rises. When standing still, she falls down! While spinning around, the user has to try to discover and focus on a second layer of images, on top of the 360 degree landscapes, consisting of bubbles floating through space, filled with… the other users. Altogether, this (Urban) Jungle, populated by numerous dancing giants, insects, breath-taking panoramas, hybrids, star fields and robots, gives a taste of the latest developments in our shared technium, through interactive play, serious gaming and cross-media production experiences. All works show an innovative and experimental approach to the different (new) media technologies of our times. The projects in the MediaLab are developed by an international crew of artists, educators and art students. Well-known names like Kyle McDonald, Pleix, Ryota Kuwakubo, Arturo Castro and Marnix de Nijs –to name a few – are showing their latest developments, as new work or adapted versions of existing pieces. erhaps what is most exciting about Cinekid’s (Urban) Jungle MediaLab in 2012 is the extent to which the ‘urban’ and the ‘jungle’ converge. Urban elements include the dance battle of Giants of the Hoods, the installation StopTrain, which animates the ever-evolving city landscape, and Leap in the Deep, where kids jump from building to building, while projects referring to the natural world of insects, tails, monkeys and sandboxes, become entangled with the former in a meaningful interaction. The level of awareness surrounding this process of interaction between man and his inventions is sometimes rather virtual, sometimes playful and sometimes even disturbing, but the experiments and its effects are fascinating and tell us something about the world to come. Media technologies change the way we perceive ourselves and how we relate to the things and the people around us, and maybe these boundaries between us and the world surrounding us are not always that clear anymore. The mediated world we live in today is immersive and ubiquitous, oh so exciting, pervasive and constantly changing. It is alive! Come, play, enjoy, find out!